Winston Churchill was known as a great speaker, a leader in World War II and the greatest Briton. After spending time in Cuba as a war reporter during the War of Independence, Churchill also became known as a devotee of Cuban cigars. He often joked that Cuba was always on his lips. Winston Churchill was born in 1874 and did not appear to be bound for greatness, as his father often reminded him. He barely made it into Royal Military Academy Sandhurst after spending his youth bouncing from school to school. In Sandhurst, he thrived and went on to begin his career as a war reporter after graduation. After his formative time in Cuba, Churchill fought in wars in Sudan and India. While in South Africa reporting on the Boer Wars, Churchill was taken prisoner and famously escaped by climbing a prison wall and jumping on a passing train. Churchill’s reputation for the dramatic began with this courageous act. He made his move into politics when he was appointed MP (Member of Parliament) of Oldham. In World War I, Churchill acted as First Lord of Admiralty and was lambasted for Britain’s many losses at sea. He resigned, but remained in politics. Churchill’s political career continued, but he certainly experienced setbacks. He persevered through these difficulties and was eventually appointed to Prime Minister in 1940. Churchill had spoken out against Hitler years before. At the time of his appointment, Britain was losing in a war against Hitler and Germany. It was in these hardest years that Churchill gave some of his moving and memorable speeches. 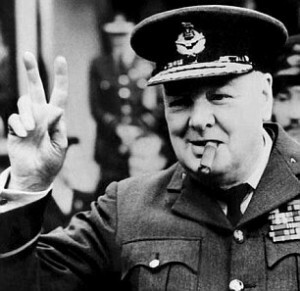 In Churchill’s famed Battle of Britain speech in June of 1940, he addressed to the British people while smoking a cigar. He most famous words came from this speech: “We shall fight on the seas and oceans, we shall fight with growing confidence and growing strength in the air, we shall defend our Island, whatever the cost may be, we shall fight on the beaches, we shall fight on the landing grounds, we shall fight in the fields and in the streets, we shall fight in the hills; we shall never surrender.” Churchill also acted as the Minister of Defense through the rest of the war. Britain went on to defeat Germany with the help of USA and Canada. Outside of his political life, Churchill was a remarkably well-rounded man. He enjoyed painting, literature and his pets. He married Clementine Hozier in 1908 and they had five children. Winston Churchill’s loyalty to Cuban cigars never flagged, smoking 9 cigars each day until his passing in 1965 at the age of 90.